My favorite expression about Barack Obama is “Everything is calculated.” I read comments and commentaries about how inept he is — that he does not know what he is doing. Ha! Obama knows exactly what he’s doing. How in the world do you think that the so-called Arab Spring came about? Obama was a major player in this, and his Puppetmaster, George Soros, supplied the money. The plan was to destabilize the Middles East, and rid the Arabic countries of their secular governments, and replace them with the Muslim Brotherhood. That was the plan. His diabolical plan backfired in Egypt. Not only was his great buddy, Mohamed Morsi, ousted, but he was incarcerated in 2012. He still sits in a jail cell to this day. Egypt also jailed many members of the Muslim Brotherhood, and made it a crime to be part of this terrorist organization. Think about this: Obama has hosted the Muslim Brotherhood in the White House on several occasions. He has not hidden this from the press. This is so serious to the Egyptian government, that Obama and Hillary Clinton have formal charges filed against them in Egypt. WHAT’S SO BAD ABOUT THE MUSLIM BROTHERHOOD? Links to the Nazis began during the 1930s and were close during the Second World War, involving agitation against the British, espionage and sabotage, as well as support for terrorist activities orchestrated by Haj Amin el-Hussaini in British Mandate Palestine, as a wide range of declassified documents from the British, American and Nazi German governmental archives, as well as from personal accounts and memoires from that period, confirm. Reflecting this connection the Muslim Brotherhood also disseminated Hitler’s Mein Kampf and The Protocols of the Elders of Zion widely in Arab translations, helping to deepen and extend already existing hostile views about Jews and Western societies generally. In November 1948 police seized an automobile containing the documents and plans of what is thought to be the Brotherhood’s `secret apparatus` with names of its members. The seizure was preceded by an assortment of bombings and assassination attempts by the apparatus. Subsequently 32 of its leaders were arrested and its offices raided. The next month the Egyptian Prime Minister, Mahmud Fahmi Nokrashi, ordered the dissolution of the Brotherhood. On December 28, 1948 Egypt’s prime minister was assassinated by Brotherhood member and veterinary student Abdel Meguid Ahmed Hassan, in what is thought to have been retaliation for the government crackdown. A month and half later Al-Banna himself was killed in Cairo by men believed to be government agents and/or supporters of the murdered premier. Al-Banna was succeeded as head of the Brotherhood by Hassan Isma’il al-Hudaybi, a former judge. In 1952, members of the Muslim Brotherhood are accused of taking part in arson that destroyed some “750 buildings” in downtown Cairo — mainly night clubs, theatres, hotels, and restaurants frequented by British and other foreigners — “that marked the end of the liberal, progressive, cosmopolitan” Egypt. 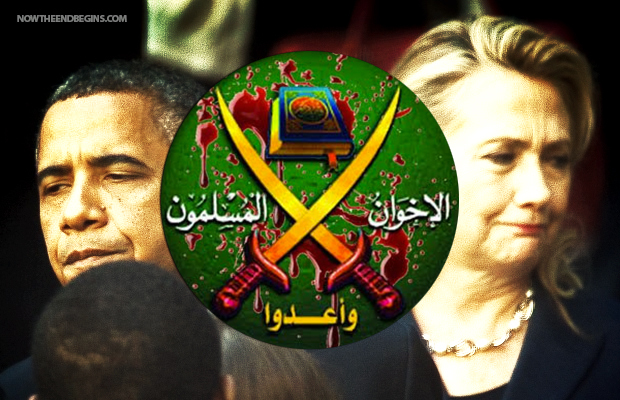 It does not take a rocket scientist to clearly see that BHO and Hillary are Muslim Brotherhood operatives. People – we ARE the frogs in the pot of water, which is heated very slowly as we happily hop around. The water get a tiny bit hotter little by little. Then, without seeing it coming, we are boiled and destroyed. It most certainly may be too late for us. By that I mean that America has turned her back on God, and is so immersed in gross, unspeakable sin, that God’s judgment IS Barack Obama, and possibly Hillary Rodham Clinton in 2016.